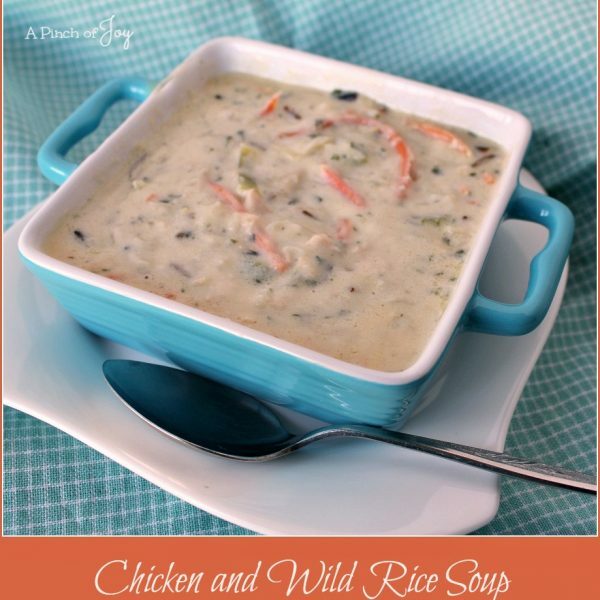 Chicken and Wild Rice Soup is creamy delicious, richly satisfying and rumored to be a copycat of the wildly popular Panera version. (I personally haven’t gone that far down the Panera menu – just found my favorite and stopped there!) It is guest worthy – lunch or dinner, with a small salad and a light dessert. Serve it to the family one evening and take the leftover soup to work the next day for a yummy lunch. 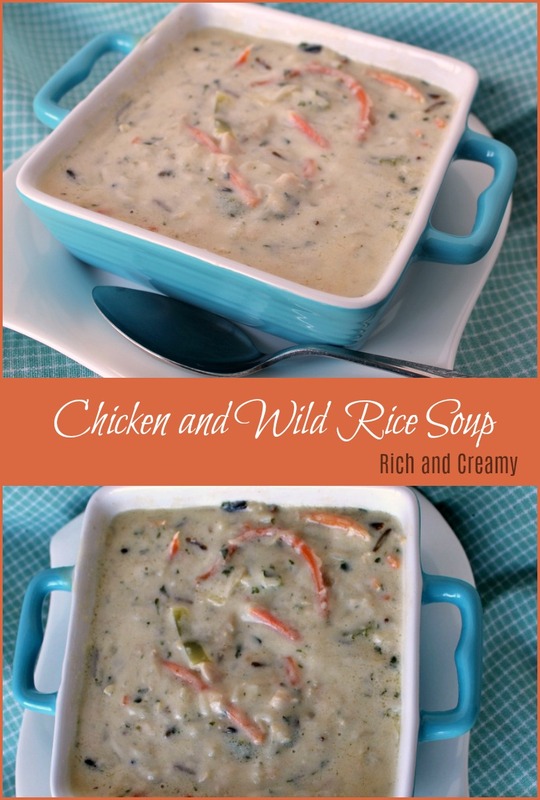 I prefer the original wild rice blend because I like the texture of the rice better. I used the basic chicken flavor and Uncle Ben’s brand, but choose the flavor variety of wild rice blend that matches your family’s taste. It takes about 20 minutes total to cook. You can use the quick cook version of the wild rice blend by turning off the burner under the soup pot, stirring in the rice and covering tightly and let set until needed. One cup of diced chicken breast is the equivalent of one chicken breast, cooked and diced. The fastest way to cook a chicken breast is to slice it in pieces about half an inch thick and grill it in a countertop grill for about 6 minutes. Or you can use one 12 ounce can of chicken, drained. Or a rotisserie chicken from the deli. Or leftover chicken from last night. For the chicken broth, look for low sodium, and if you can’t find it, substitute one or two cups of water to reduce the salt taste. Make this once with the cream – so good! And perfect for serving guests. However, I have also made this with half and half OR with a can of evaporated milk plus one and one half cups of 2 percent milk. This is a very forgiving recipe!!! It is best that the rice and broth do not overcook so a little advance preparation in making the roux and vegetable mixture helps time management. Warning: DO NOT let the following scare you away from an awesome soup experience! Your soup will turn out fabulous, even if you don’t follow the suggestions below!! But if time management is a concern for you when cooking – consider these points. Gather ingredients in one place before cooking to make the process more efficient and to make sure you don’t overlook something. Use a chopper for the onion OR use frozen chopped onions (from the freezer section). For celery, split the rib lengthwise – twice if it is a broad rib. Quickly make a fine dice by cutting across the split rib. I like shredded carrots in this soup for appearance and quick cooking. Buy them in the produce section. OR Hold two slender carrots together tightly and slice both at once to speed things up. If you are a newby cook, you might want to do these things before you start cooking. Especially if you haven’t made roux before either. You’ll feel less rushed – not what you want while doing something that can be fun! Place the butter in a pan over a medium low heat. I use a straight sided 10 inch non-stick skillet. If you’ve done the vegetable prep ahead of time, go ahead and add the vegetables and stir occasionally until they begin to soften. I do all the vegetable prep while the butter is melting and add each vegetable to the pan as I finish chopping. You can move the veggies off to one side where they will continue to cook as you begin to stir in the flour. Once you start the roux, you’ll need to keep moving. A roux is just fat and flour mixed together smoothly – no lumps – to serve as a thickener or the base for a sauce. When the butter is mixed in, begin to add the cream, about half a cup at a time. Whisk continuously and add more cream as the roux absorbs the cream you already added. It will begin to thicken very quickly at one point, so just add the remaining cup or so of liquid and whisk it in until smooth. Your goal is to take about 10 minutes to saute the vegetables and make the roux — which is half the time needed to cook the rice. If it takes longer for that – so be it. Just don’t forget to turn off the stove if your toddler decides a potty break is NOW! Stir your veggie masterpiece into the rice and broth and continue to cook another 10 minutes or until the rice is done. Serve and enjoy!!! 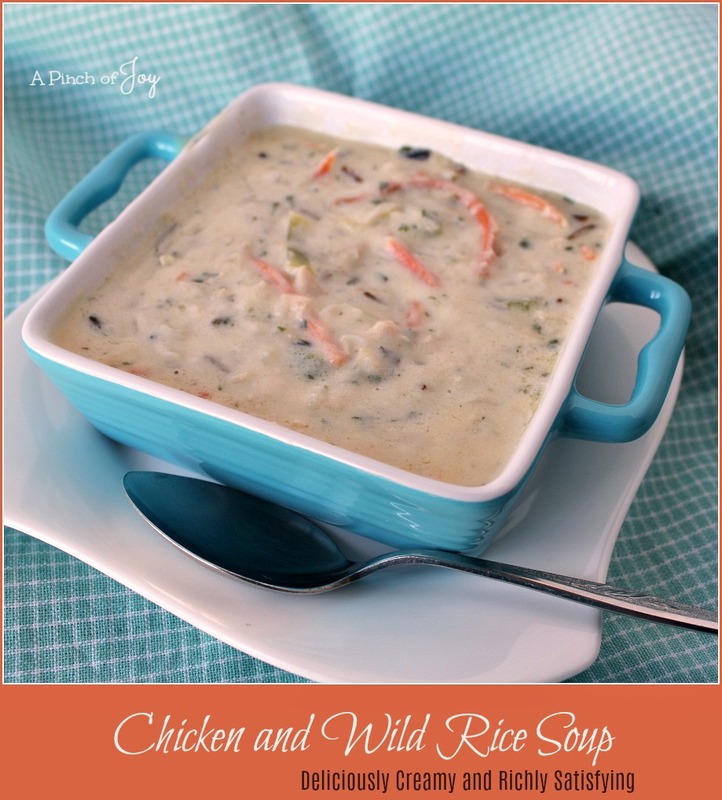 Chicken and Wild Rice Soup is creamy delicious, richly satisfying and rumored to be a copycat of the wildly popular Panera version. Guest worthy and great the next day IF there is any leftover for lunch. Cook chicken, if needed. In the meantime, in small bowl or measuring cup, combine pepper and flour. Set aside. Measure cream and set aside. Pour broth into soup pot. Add chicken. Bring to boil over medium heat. Open rice and set aside seasoning packet. Stir in rice, cover and simmer. In meantime, melt butter in medium saucepan or skillet over medium heat. While butter is melting, dice celery. Add celery to melted butter and reduce heat to medium low. Chop onions and add to butter in pan. Measure shredded carrots. Add to butter, onion, celery mixture. Stir in seasoning packet. Push vegetables to one side and continue cooking until vegetables are softened. Gradually add seasoned flour to vegetables and butter, stirring constantly to make a roux. Whisk cream into the roux, a bit at a time, until it is all mixed in and smooth. Cook just until thickened. Add thickened cream and vegetable mixture into simmering broth and rice. Continue to simmer for additional 10-15 minutes until rice is done.